I am not exactly sure of the date of Joe's birth, but I do know it was in January. We got Joe when he was about four or five months old. The kids were so excited to have him. He was more like a dog than a goat. I even found Joe in my house a few times. He loves to eat my landscaping and terroizes my dogs. 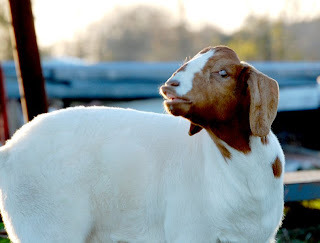 Joe really is a great laid back goat. When Joe was younger, the kids would call to him and he would go running after them. It really was so sweet. Now when the kids go running Joe goes crazy. I wish I would have gotten a picture of Joe with all four legs going in different directions. I really don't know how he does it. But his head will shake and his legs will jump and he will run like the wind. Joe was so excited to have the kids out and playing with him. Big Cowpoke played with Joe on his large spools. But Joe wanted to go out and about, not stay in his pen. He ate a lot of grass and ran around a bunch. Goats are so super hard to get a good picture of. And then when Joe would pick his head up and look at me I had a Cowpoke run infront of me. But they all had fun. Joe's big ears kept covering up his golden eyes. He has some sweet eyes. Joe was really grateful for getting a chance to run around. I really wish I could turn him out with the horses, but I am affraid he wouldn't stay with the horses and wonder off. And plus coyetes can't get Joe in his pen. I think Joe was really happy to be out. I even caught a little smile on his face. He also had other looks on his face. Cute, what is that look Joe? Then I got a closer look. My little stud muffin, found somthing he liked!! I wonder if Joe ever gets sad because he is the only goat out here. But he does have some nice Cowpokes to play with. "Hey there little girl!! What ya doing? 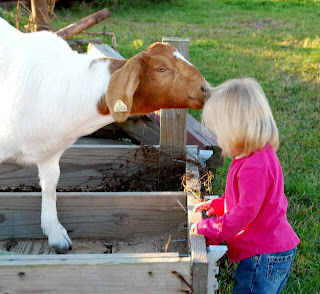 You wouldn't mind if I had a little taste of that hay you have on your head, would you?" Almost better than birthday cake!! Joe loves to nibble on my hair too. It must really look like hay to Joe. I hope Joe enjoyed his birthday fun!! And that is all there is!! The End. I had a goat when I was little and I tell my husband all the time I would love to get one of those little dwarf goats they are so cute ! Happy Birthday Joe! Joe probably wishes you would have given him a play day with a doe rather than the kids, but that would not have provided such cute pics. Great pics! 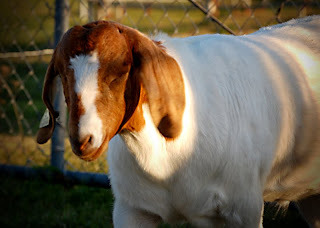 I love my goats, they just crack me up! Such characters, they are. 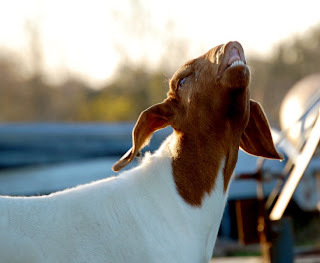 Goats are just cool! I have 2 goats. 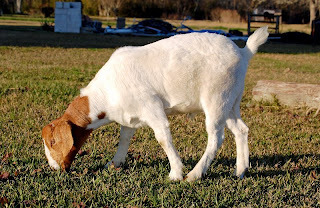 When I take my horse out of the pasture to groom her, the goats follow her. Then, I will walk down the dirt road and they follow all the way down and back. No leash, no worries. What kind of fence do you have your horses in? If it's just a board fence (like the arena), it won't keep them in. They don't go far from the fence though. Oh my gosh, You just took me back on a trip to my childhood!! 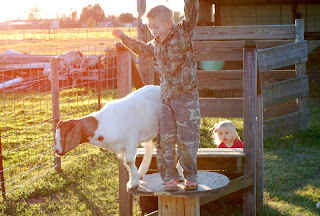 My brother and I had a goat named "Buddy" when we were little. We were big into cowboys and indians when we were and buddy was a key player. All summer buddy wore a gunbelt and a red bandanna. 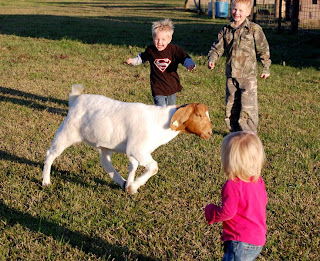 That is so awesome your kids get to grow up in the country and have such great animals!!! Happy Birthday Joe. Awww Happy Birthday Joe! Wow he has grown a LOT Andrea. Too cute. Looks like he and the "kids" all had a blast out playing!! I like that. It is so funny. Happy birthday Joe. 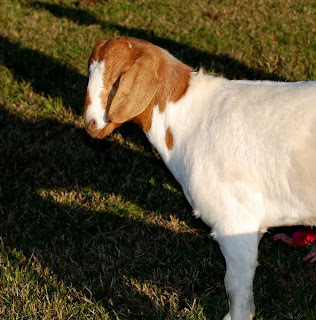 My alternative high school students raised an orphan goat, in the room, one year. She used to ride to school with me in the car. 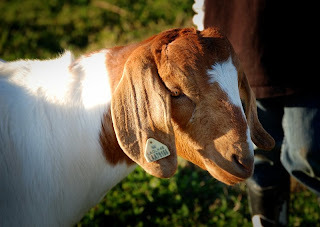 We love our goats too, my hubby keeps track of their birthdays and if they are at our house still they get a big handful of sweet feed all to themselves. I love the faces they pull, even our babies curl up their upper lip and smile. Joe's grandma here!. How he has grown. 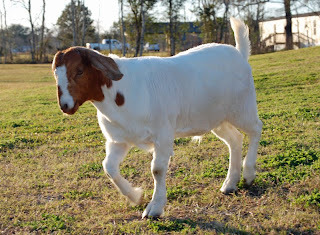 I wish he was being used as a show goat, he really looks like he might have pretty good muscle under all that winter coat. Joe's actual birthday is Jan.17th. I'm really glad your children have enjoyed playing with him. I know he has a really good home and lots of love. HAPPY BIRTHDAY JOE!!!!!! I just love him, the sweetest face! He has gotton big! He and the little cowpokes are too cute! Wow Joe has grown! His coat look so smooth compared to our Boer goat, Pepper. Of course, we believe our Boer is mixed with Angora, too. He gets long lock of curly hair on his neck and sides during the winter. 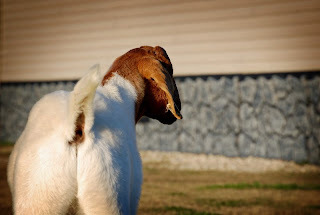 Boer goats have such goofy personalities, don't they? Is Joe a buck? Will you breed him? 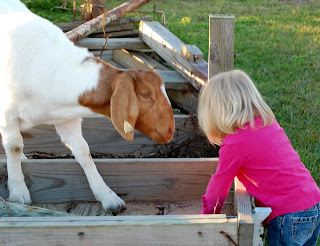 All our male goats are wethers, just pets and 4-H family projects. We've got 2 Nigerian wethers, 1 Boer cross wether, 1 Mini-Mancha doe, and 1 Angora doe. I like Joe! He's a cutie pie! It looks like Joe had a great day and that he really likes to play with the kids. How cool is that? Joe has gotten BIG!! He went from a cute, little stinker to a handsome young buck! Gee-that reminds me January is Red Dog's birth month too. Hmmm...I'll have to see if I can find some pictures of him as a puppy. I just wanted to let you know that I just got my box and thank you ! Also - LOVE the Sunday pic! Happy Birthday Jo..You sure are cute..
Awwww Joe's just so cute...what a personality...I really want a couple of goats, but I'm sure the coyotes or mountain lions would get them eventually...I'd be worried sick. He sure makes a great playmate for the Cowpokes!